This is just a quick message to implore any and all fantasy lovers and/or supporters of Doctors Without Borders to join Booknest’s Fantasy Fundraiser’s Thunderclap campaign. What’s the deal with Thunderclap? You visit Booknest’s Thunderclap page. Select whether you’d like to show your support through Twitter, Facebook, Tumblr – or all three! On 28th December, if we make it to 100 supporters (currently we’re sitting at 60), Thunderclap will send out a one-time tweet/post through all the supporters’ accounts. Hopefully this will give us the boost we need to reach our donations target on JustGiving. You can read more about this incredible project below! Peter Tr, founder of Booknest.eu, has organised something brilliant, turning his idea for a fun competition into an insanely exciting charity project. Check it out! 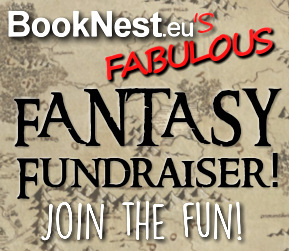 Booknest’s Fabulous Fantasy Fundraiser (#BooknestFFF) brings together one hundred (100!) SFF authors in a bid to raise as much money as possible for Doctors Without Borders (Médecins Sans Frontières/MSF). As you’re reading this, BFFF is raffling off books donated by myself and ninety-nine other authors. Each of the books will be signed, dedicated, and shipped straight to the winners. Every £1 (GBP) you donate gets you 1 ‘ticket’ in the raffle. On January 1st 2017, Peter will kick off the new year in style by drawing six winners, each of whom will receive a bundle of ten randomly selected books from the raffle. What about the other books? Well, the remaining 40 will be split into two equal lots, both of which will be auctioned off later in January. Médecins Sans Frontières do amazing work across the globe. And with just £1 per ticket – and all those amazing books waiting to be won! – you could help them do even more. So enter now, and please help us spread the word. Feel free to use any of the banners above when sharing across social media, and use the hashtag #BooknestFFF. THANK YOU, and HAPPY CHRISTMAS!